The recent bipartisan health care bill, posted here, is an attempt to save the cost-sharing reimbursements that the Orangutan ended last week, and that the White House (the adult day care center) has not endorsed. This is what Health Care.gov says about these copper plans, with commentary from Don McCanne of Physicians for a National Health Plan. 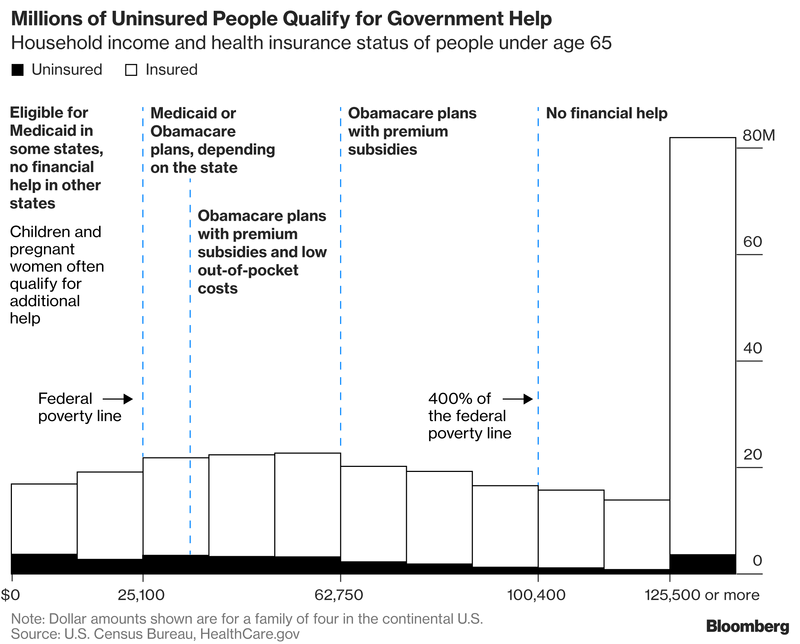 Catastrophic health insurance plans have low monthly premiums and very high deductibles. They may be an affordable way to protect yourself from worst-case scenarios, like getting seriously sick or injured. But you pay most routine medical expenses yourself. Deductibles — the amount you have to pay yourself for most services before the plan starts to pay anything — are very high. For 2017, the deductible for all Catastrophic plans is $7,150. According to Dr. McCanne, the bill will extend CSR’s for two years in exchange for concessions from Sen. Patty Murray. One of those concessions, Dr. McCanne says is to allow anyone to purchase on the exchange the catastrophic plans that are currently available only to individuals under 30 or those who qualify for certain hardship exemptions. These plans are sometimes referred to as copper plans, indicating that they have an actuarial value below the other metal tier plans (bronze, silver, gold, and platinum). The appeal of these plans, he adds, is that their premiums are very low, but that is because their actuarial value is only 50 percent – they cover an average of about half of health care costs. For 2017, the deductible for these plans is $7,150. He believes that the concept that we can take beneficial policies and detrimental policies and combine them to come up with a reasonable compromise is a fallacy. Bad policies are bad policies, and they cannot be neutralized by political accommodations. His solution is a national health plan. Otherwise, it is either copper or a cop-out. This entry was posted in ACA, Affordable Care Act, Catastrophic plans, Copper Plans, Cost-Sharing Reductions, CSR's, Exchanges, Health Plans and tagged ACA, Affordable Care Act, Alexander-Murray Bill, Bipartisan, Catastrophic plans, Copper Plans, Health Plans on October 19, 2017 by Transforming Workers' Comp. For my first post of the year, I want to re-post an article published yesterday by my fellow medical tourism blogger, Maria Maldonado of Trip4Care. Maria has written an excellent article outlining the benefits of medical tourism for an employer’s health plan, so naturally the same can be said for workers’ comp, especially with regard to self-insured or even opt-out employers. Medical Tourism: A Component of Your Health Insurance Plan? Given that medical tourism is an option chosen by many to get procedures not typically covered by insurance, it may come as a surprise that medical tourism is also something that is growing in popularity as an additional health insurance benefit—especially for self-insured companies. Let’s take a look at the reasons behind this trend. The employer saves money. This is especially true for employers who opt to “self-insure” (i.e. the employer acts as an insurer, and pays the employee medical expenses rather than providing a separate insurance plan). Since many procedures can be completed internationally for a fraction of the cost of the same procedure at home (even including the cost of travel), this is one of the biggest drivers behind the trend, for both self-insured organizations and other insurers. The employees get more options. Giving employees additional benefits like this can be used as a recruiting tool, helping organizations to secure talent. The employees have the choice to travel– possibly at no personal cost – for some treatments, and may be able to take a vacation at the same time. The option for coupling international travel with a medical treatment can be a major benefit for some employees. Technology makes this process easier than in the past. With the wealth of information available at the click of a button today, it’s easier than ever to research the procedures that are available internationally and gain trust. Additionally, there are companies like Trip4Care that can facilitate all aspects of a medical tourism trip, making administration simple for the organization. Employees do not sacrifice health outcomes. Naturally, companies who opt to take this route should take care to ensure to partner with companies offering the highest standard of care. In this way, everyone benefits and costs are kept low. Keeping employer costs low also benefits the employee in the form of low premiums. It stands to reason that if costs are kept low throughout the group, there will be less rationale for premium price hikes. Another win-win. Keeping costs low benefits, the employee through lower shared expenses too. Whether the healthcare plan’s coinsurance is 20%, 30%, or more, it all adds up. Keeping total expenses down for the patient is beneficial for everyone. Besides the obvious cost savings, this can reduce the stress involved for employees who have to seek medical care—reducing the financial burden can relieve some of the anxiety. Adding medical tourism coverage could make providing dental care more affordable. Dental procedures are a perfect example of a procedure that can often be sought internationally for less money than at home; employers offering dental coverage can take advantage of that. Treatment wait times may be shorter. In cases where an employee may be subject to a lengthy wait list for a treatment at home, medical tourism options may give the flexibility to avoid that wait list and get treatment faster. This is yet another benefit for employees and employers alike. Self-insured companies have the flexibility to do this right away. While this trend may take some time to take hold, it’s always great news to hear that more options will be available to more patients—allowing individuals to have more choices in their healthcare. It has been pointed out in the past that doing this for either health care or workers’ comp is too complex and too costly; but as I have said many times before, we went to the moon more than once, and that was infinitely more complex and more dangerous than sending employees to another country for medical care. Tell Me Again Why Medical Tourism in Workers’ Comp is a Bad Idea? So when people tell me this idea is ridiculous and a non-starter, or that I have no credibility, or some other lame excuse why it won’t be considered, I go back to the points made in these seven articles above, and many others I have written that says it is possible. It’s just our lack of vision that makes it so. The only things preventing it are the complexities of the health care or workers’ comp systems that are harming the systems, making them more expensive than they should be, people defending the status quo so that entrenched interests continue to game their respective systems to the detriment of the patient bases they service, and to those who would like to change them for the better. We have seen this in our tax code, our politics, and many other facets of life. But it does not have to be that way. We can make things much simpler, but it requires employers, carriers and others to do so. Saying it can’t be done or it is too expensive only makes things worse. We went to the moon; no one ever said it was too expensive to go, too complex to go, too dangerous to go. We went, and we went many times, but in the end, the naysayers and right-wing penny-pinchers who were really diverting that money into the pockets of the wealthy, shut down our space program, so that now we have to hitch rides on Russian rockets. That’s what we get for saying it is too complex. That’s why the supercollider is in Europe and not in Texas. We have given up and given in. The world is changing, globalizing. Let’s not blow that too. In other words, what’s good for the health care goose, should be good for the workers’ comp gander. This entry was posted in Employees, Employers, Global Health Care Services, Globalization, Health Insurance, Health Plans, Medical Tourism, Medical Travel, Non-subscribers, Paralysis by Analysis, Self-insured, Workers' Comp, Workers' Compensation and tagged Employees, Employers, Globalization, Health Care, Health Care Costs, Health Plans, Medical Costs, Medical Tourism, Medical Travel, Workers' Comp, Workers' Compensation on January 13, 2016 by Transforming Workers' Comp.